Posted On July 27, 2014 by Team iCynosure. Since the time I was eligible to drive, I've lived in London… studying, working and then finally settling after my wedding. I loved to drive in the British Capital not only because of the systematic beauty of the perfect road manners but also because of the automatic drive. Almost 99% people that I knew drove an automatic but the percentage back home in India is almost the opposite with everyone wanting the manual route. When we moved back I had a tough time adjusting to manual vehicles and the crazy traffic conditions in Mumbai. Coupled with these factors, and the soaring petrol prices with an unavailability of automatic affordable versions I have practically stopped driving in traffic-laden Mumbai infested with rickshaws and scooter-bikes. That's going to be true, until Now! 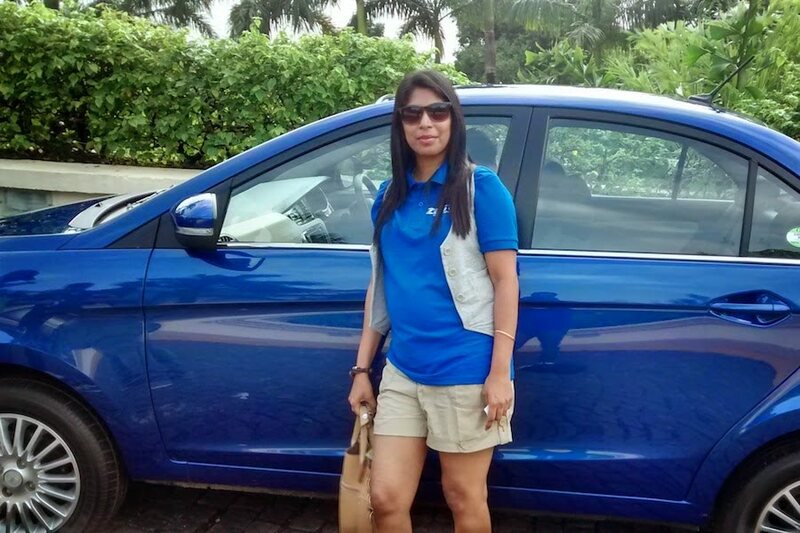 Having experienced the newly launched Tata Zest, I can confidently say that my love-affair with driving is in its blossoming stage and shall soon be a full-fledged romance. Targeted at the young guns like myself, Tata has entered the fastest growing Indian car category with a much thought-out practical approach. Giving tough competition to its competitors like Maruti D’Zire (I sporadically drive this at the moment) and the Honda Amaze, Tata Zest scores higher points through various aspects of design, overall built, comfort, cabin, boot space and hopefully even fuel efficiency. The three avenues that the team at Tata has based the new product and future launches on DesignNext, DriveNext and ConnectNext. The DesignNext exteriors have been accentuated by three prominent cuts and lines... The Humanity, Diamond DLO and the Slingshot. The DriveNext has been armed with a Revotron 1.2T that offers Multi-drive modes which could be enjoyed at the click of a button. The exterior is a visible change, far away from the other cars from the TATA Garage. The external body looks well thought of with a sleek stylish exterior that enhances driver productivity. What I really liked are the placement of the fog lights and the daytime lights giving room to each other and the shape of the projector headlights which makes it look super classy. Even the LED tail lamps are highlighted with wraparound LED and a chrome strip. The highlight is that the vehicle isn’t compromised with small sized tyres, but are loaded with 15-inch alloy wheels that would enable great ground clearance. That is a blessing on Indian roads, especially Mumbai where no road remains the same after every monsoon and the potholes get bigger and wider each day. The interiors are right in the league with all its competitors and even surpass popular features of some much-liked cars. The cabin is more spacious and the dashboard could give competition to the best in the industry. The cabin is comfortable for five individuals with decent seat and leg room at both front and rear. A positive improvement in the infotainment and voice command is noteworthy, powered by a Harman touchscreen with Bluetooth connectivity and 8 speakers. Voila that's my music room everywhere I go.... soft music for a romantic drive with my husband or foot-tapping numbers for when I drive around with my pals. You have to give the credit to the engineers who I believe have put in that extra Zest in ensuring greatness under the bonnet as well as with a 1.2-litre Revotron engine. Though I’m not such a technical wizard, even I understand that the four-cylinder engine extends into an amazing torque aiding easy manoeuvring through traffic while aiding a quick switch between three drive modes – Sport, City and Eco. I drove both the variants (Manual Petrol and Automatic Diesel) in scenic Goa through a mix of smooth and rough roads and the drive was comfortable. Apart from the things that made me look again, things that really stood out for me are the first in its class stability factor with the way it is built with pronounced cuts and lines, the Revotron engine, a hard-baked steel body that protects during incidents and an above expected phone-voice integration. I loved the ease of altering between the multi-drive modes Eco, City and Sport at just a click of a button. When I switched on to the passenger seat, it was even more spectacular. The passenger seat is spacious and comfortable with enough shoulder and legroom in both front and rear seats. The Zest is by far the most fashionable, the most comfortable and the most updated car in India today. The Manual petrol was a good drive with most of it smooth while the Automatic Diesel was a dream. Between both the variants, I personally felt that the Switch Modes worked better on the automatic version as compared to the manual version. Of all the modes, the Sport mode adds a zing to the driving experience with a five-speed transition and three digit speed limits that can be easily achieved. The two factors that would really influence my purchasing power and up the ante for the world-class product are the price positioning and the on-road and off-road mileage. My vote would definitely go for the AMT Diesel as I have driven an automatic most of my life. Having said that, it is not the easiest thing to get along with and like everything else will take some time getting used to. But once I've had a hang of it, it will be a blessing in disguise especially in a city like Bombay to #ZestUpYourLife.